Classes resume 25th February 2019. Find out what people are saying about Happyfit! Happyfit is about helping you get healthier and happier. Happyfit aims to help you make exercise an integral, positive and life-enhancing part of your week. 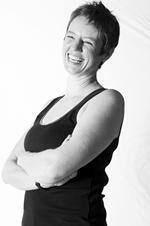 Happyfit offers Personal Training, Pilates Classes, and Circuit Training Classes in Shropshire. I can also do fun-filled and energetic birthday parties for your little ones (children's parties). Hello, my name is Rachel Stevenson. I am 42 years old and I live in Shropshire. Previous to retraining as a fitness professional in 2008, I was a qualified and registered childminder for five years and even further back, I went to agricultural college and milked cows for six years. My interest in fitness and my wish to start my own fitness business has probably always been there (deep down underneath) although three pregnancies, huge weight gains and eating the wrong things masked it for many years. Through personal experience, I understand the link between fitness, health and happiness. Also, I have three children, a husband, two dogs, a house and a business and I really do understand that there are not enough hours in the day to do everything! But it is about priorities, what if I told you that making time for exercise will benefit your life in every way? The benefits of exercise are immense, not just the health benefits (such as the reduced risk of heart disease, prevention of high blood pressure, etc., etc.,) although these are hugely important but it is the other benefits that have the most immediate impact. Exercise will give you: more energy; better sleep; an improvement in the way you feel about your body; higher self-esteem; and lower stress levels. With these benefits every other aspect of your life will feel easier and more enjoyable. I can help you to find the time to exercise. I can come to you or you can come to a local class. The exercise that you will do with me will be the most effective and efficient in the time available. I can motivate you and keep you on track. There will be no wasted time or effort but you will have fun and you will achieve what you want to achieve (and probably more! ).